MorganStanleyGate: BOGUS Felony Charge Intended To Cover Up The Many Felonies of Judge David Q. LaBarre DISMISSED . . .
BOGUS Felony Charge Intended To Cover Up The Many Felonies of Judge David Q. LaBarre DISMISSED . . .
On July 3, 2012, Spencer C. Young was UNLAWFULLY deprived of his right to freedom, the day after he filed a 30-page indictment of criminal charges against Durham Judge David Q. LaBarre and his girlfriend. Mr. Young was denied bail for 127 days and then regularly tortured while incarcerated with the most dangerous of felons. 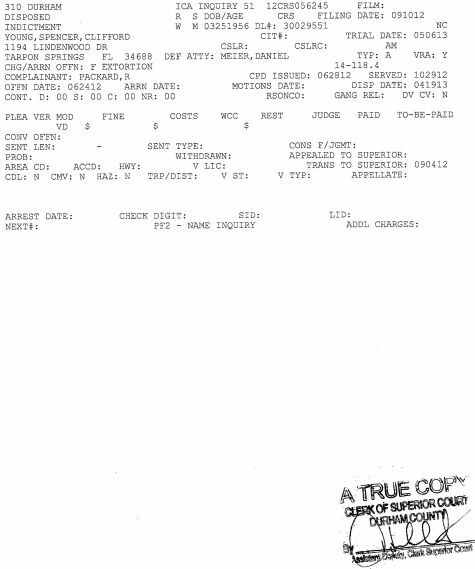 His violent arrest in Florida by U.S. Marshal SWAT team was SOLELY predicated on a BOGUS felony charge, which has finally been DISMISSED (see below). 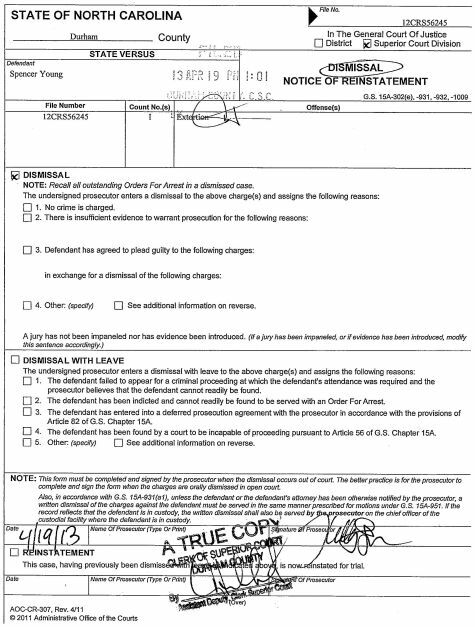 Upon closer observation, the reason for the dismissal is not specified on the document -- the box "No crime is charged" is not checked, nor is the reason indicated on the data printout (also shown below). Requests to have this corrected have been ignored -- hence this is deliberate. Moreover, the Asst. District Attorney involved in this abomination of justice, Kelly Gauger, has still not dismissed the even more outlandish misdemeanor charges, as she earlier promised to do -- other nefarious COVER-UP plans are in place. This BOGUS felony charge was literally made up out of thin air in order to COVER-UP the extensive criminal activities of Durham (NC) Judge David Q. LaBarre and his girlfriend, Leah R. Krier (the "LaBarre Larceny Scandal") . . . and so much more.